The Spanish Club just finished their 4th annual School Supply Drive to benefit students in the Dominican Republic. With help from the Middle School we collected many new school items and donated old eyeglasses. Congratulations to Mr. Phillian's 5th grade class for bringing in the most - over 680 items! They received a taco party in March. Special thanks to all who participated! If you are interested in donating to our cause, contact Miss Shaffer at shaffer@wasd.school. 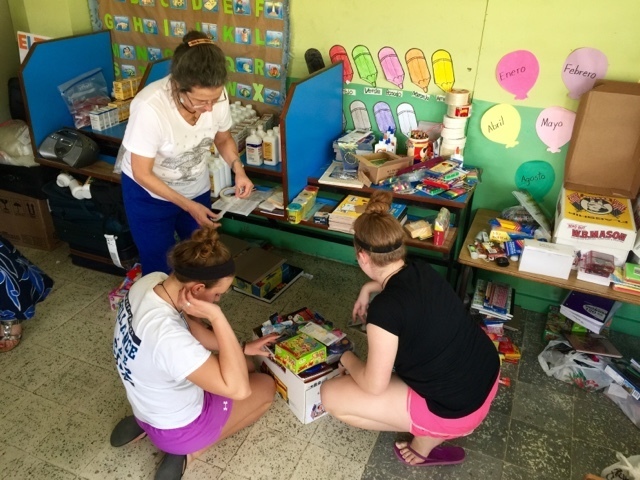 Every year since the Spanish Club has started the school supply drive, supplies have been sent to a school in the town of Sabaneta de Yásica, Dominican Republic. Club Adviser Miss Shaffer and various members of the Spanish Club have had the opportunity to travel to Sabaneta as well. Our supplies arriving in Sabaneta below!